Han the oldest son turns 21 today! Okay, here is the birthday riddle! With 2 sisters older than Han, he will still be the first to celebrate his 21st birthday today with the family. How is this so? Answer : His two sisters left for the US just after their 5th year in secondary or middle school and turned 21 when they were away from home! So we are indeed very happy to be able to celebrate Han's 21st with him today in Singapore. Han growing up has become quite a trail blazer for his younger brothers. He was recognized to be an awesome son on his 18th birthday with reasons and photos of his life up to then found here. HAPPY 21ST BIRTHDAY WOON HAN! Classical compositions for your enjoyment! Your composition played for others to enjoy. Cool pic in the snow! The Man among the boys today ! Ooops! How did this get here? Listen to the chatter over great food especially Mom's explanation of why all students going to USA study law. ... and family members too enjoying butter crab, prawns, scallop vegetables, deer meat etc etc. Read the review given to the "Two Chefs Eating Place" near our home especially my comments at the end. Mom who cared for him in the womb for 9 months and outside for 21 years is elated! Let's start taking photos for remembrance before the cake is all eaten up! Thanks to Google+, we could have video participation to see/hear each other from 3 places simultaneously. After the live video broadcast was over, Fei in Los Angeles was able to show us around her new apartment where she and Christopher had moved in recently. Very Nice!!! Nice to have Su from her school where she teaches in Utah to be able to join us with Google+ too! Han with his 3 friends from the National University of Singapore (NUS) studying, from left to right Statistics(Tuan Anh), Chemical Engineering(Zhe Wen) and Medicine(Andrew). Han himself is preparing to serve on a 2 year voluntary mission for his Church after an impressive education record studying in Singapore noted in his family profile. All four boys above would be found as Academic Prize Award winners at a future event journalized here. On the morning of 6th Oct in Malaysia or evening of 5th Oct in the USA, we received news that Steve Jobs, the co-founder of the world famous Apple computer company, had passed away peacefully. 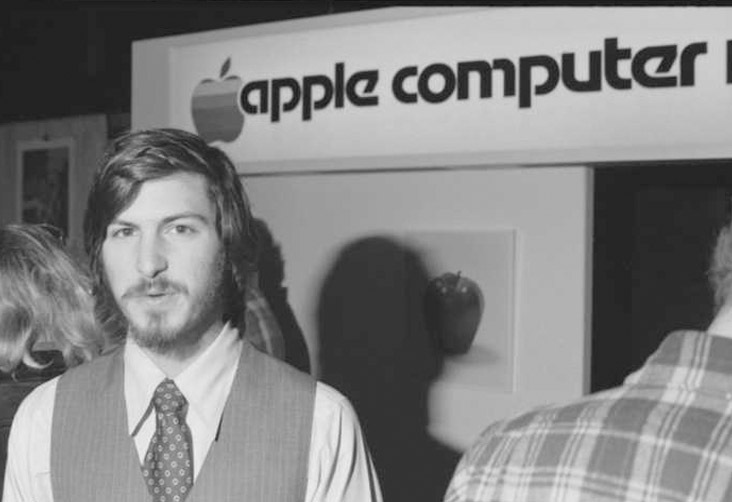 Now I have never met the man personally but due to my involvement in the computer business in the early days where the Apple computer was a revolutionary pioneer in the field, I feel inspired to create this post in memory of Steve Jobs. 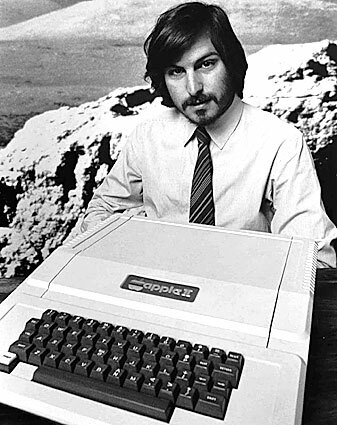 The Apple II computer was first launched by Steve Jobs in 1977, being the first computer with a keyboard and color screen. 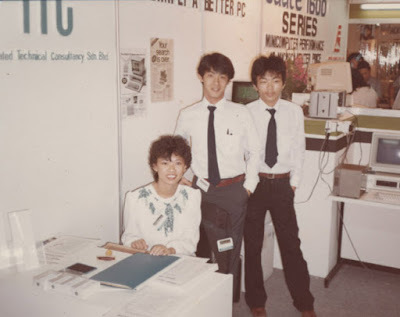 I had just started my University education in Australia and the only computer we had then was the PDP 11 by Digital Equipment Corporation (DEC). 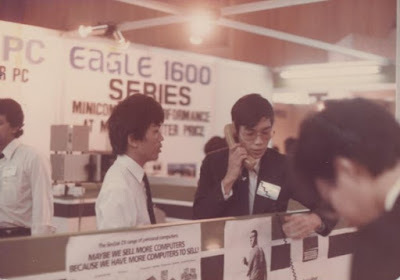 It was a 16-bit minicomputer that had a card reader to feed data to the computer! My interest in the microcomputer came after I had gone home to work after graduation. 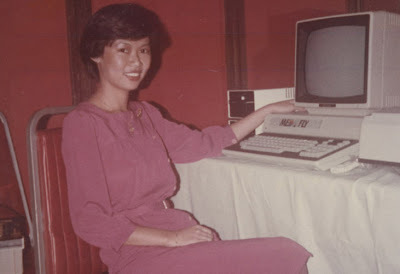 As a 3rd world country, the original Apple II was quite expensive. 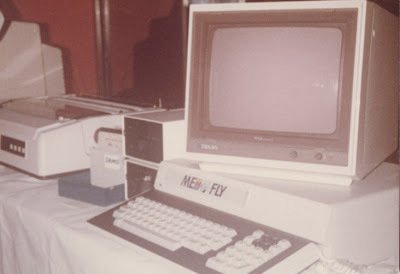 We got interested in the Apple compatibles and seen in the photo above is the Med Fly model that originated in Europe which has a symbolic name of the Mediterranean fly that killed the apple orchards of the farmers! It was such a wonderful tool to learn the basics of microcomputers and guess who became the first system support personnel when we found customers to buy these new computers? The account was journalized in an early post at the beginning of this blog. I soon found myself in a Comdex Computer show in Las Vegas USA where 16 bit IBM PC compatibles were making their debut such as the Eagle Computer from Los Gatos California. IBM had earlier launched their 16bit computers using PC DOS operating system from Microsoft. 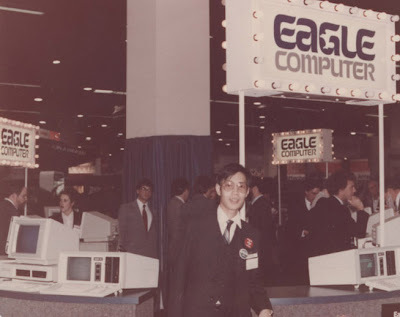 Eagle like Compaq and many other companies later began producing IBM compatibles that used the MS DOS operating system which meant they could run all software programs produced for the PC DOS operating system which IBM PCs used. This was how the IBM PC compatible industry was started with Bill Gates, the founder of Microsoft being the genius behind it. 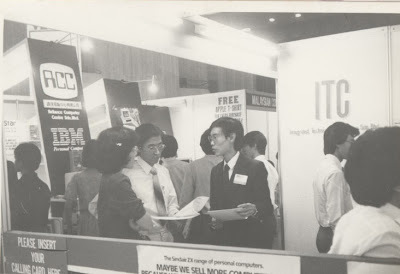 This was the beginning of ITC Group & Associates with my first company, which I had co-founded with a programmer named Alvin Tan, that began with the business of computer hardware and softwares that were IBM PC compatible. 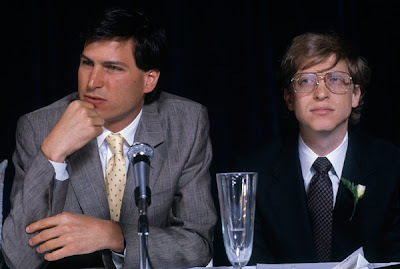 Steve Jobs of Apple and Bill Gates of Microsoft were the competing icons of the two microcomputer systems that were flooding the world ie the Apple computer with their Apple DOS and the IBM PC and compatibles using PC DOS and MS DOS. It was not until the year 2010 that I got an Apple Mac Pro computer as prices were beginning to become more competitive. I like the Apple computer for its superior graphic capabilities but somehow I cannot stop using the IBM PC compatible computers like Dell as the MS DOS operating system has too many software applications that I am dependent upon for my work and business. Maybe I'm the a annoying orange to Apple's products! It is coincidental that on the date of 5th Oct which is my birthday, the same day that Steve Jobs passed away, I wrote a blog post for my daughter's birthday on 4th Oct US time, commenting that I had created a video clip for her using the Apple Mac computer! His life and achievements can be read here. At this time, lying on the hospital bed and remembering all my life, I realize that all the accolades and riches of which I was once so proud, have become insignificant, with my imminent death. Material things lost can be found. But one thing you can never find once you have lost it, is life. Moments after speaking these words, that he had asked to be written down, Steve Jobs, aged 56, passed away." The fake quote alludes to a mindless pursuit of wealth. However, this cannot be further from the truth, because Steve Jobs has been earning a cool annual salary of $1 since he returned to a struggling Apple in 1997. He’s not the only corporate executive to do this, of course, as they can be compensated through bonuses, stock options, etc. Steve Jobs is notable though for not taking any alternative form of compensation since 2003. I am not one close to the caliber of Steve Jobs but I have shared my life story of not pursuing wealth even at an early age shared here : https://goo.gl/8WSgIW I have truly lived a happy life to this day following what I recall to be my passion and beliefs in life shared in my journals. I have already lived passed the age of Steve Jobs and look forward to living and doing more happy things that my passion and beliefs drive me to do. Live Reflections on Su's birthday as I celebrate my own at the same time! Put simply on why I feel happy today, my Joy and Happiness is being able to create on an apple Mac a video clip from my heart for Su's birthday celebrated in US on 4th Oct as I celebrate mine a day later. Due to time zone differences between America and Asia, it's like both of us are having our birthday at the same time. There is Joy and Happiness as I do this on my birthday for two reasons. One is that I'm over half a century old and it tickles me to be able to continue learning new systems as the Mac computer runs quite differently from the Microsoft Personal Computer that I've been using for years since it first came out in the early 80s. The other is that reflecting on Su's life on her birthday as her father is itself a heart warming and joyful experience. I am just glad I am able to do it on this day expressed in pics and music to share with her on her special day. So why didn't I publish the video clip right at the beginning of this post to wish her Happy Birthday? Here is the reason and it's really cool as it ties in with my thoughts this moment as I reflect them on this post! I was rushing to get it done in time, well at least while it's still the 4th in the US. I hardly touch my Mac as in as much as it is a fun tool to work or play on, too much of my work stuff and routines have been built around the PC. However I did my first video clip on the Mac for Fei last year after her wedding in Logan in May and didn't do another since then. So when inspiration/motivation came to me to do another for Su on her birthday, I struggled a bit to remember how to do it and when I finally got it made to post in on YouTube for her ...... 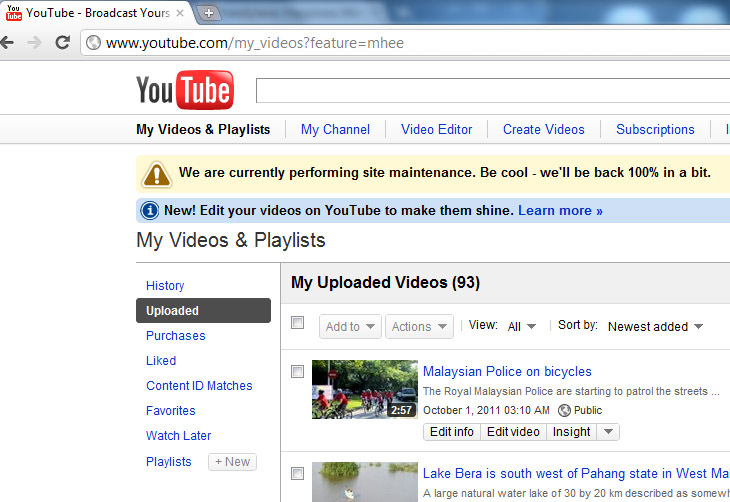 I got the message as per the above screen capture, "We are currently performing site maintenance. Be cool - we'll be back 100% in a bit. " Be cool it said? Yes in as much as I was kind of anxious to get it to Su, I must say I was cool about it. Instead of reacting with frustration, I just quickly thought of alternative solutions to get it to her. So Su Min Liu, if you are reading this, Dad looked at the size of the video clip which was about 8.5mb and knew Gmail could handle the size and emailed it to you earlier! Google said they will be back 100% in a bit so let's see how long that is because as soon as what I uploaded appears on my YouTube account, I will embed the video clip in one of the next paragraphs here. I was ready to post the video clip when I started the post about 8:11am this morning so let's see how long "a bit" takes! Well it's about 11:30am now and I've been out and back to check if it's been published but not yet after 3 hrs plus. Oh well Su has got it on the email while the rest can perhaps check out this first video clip I did for Fei Wyatt on my Mac after her wedding last year! After lunch I checked again at my 2.15pm and discovered that my upload was unsuccessful with the message, "Failed (upload aborted)"
So with patience and persistency, I attempted to upload again. After taking several minutes to see the progressive bar register full to indicate a 100% upload, suddenly another new message appeared, "We are currently in read-only mode. 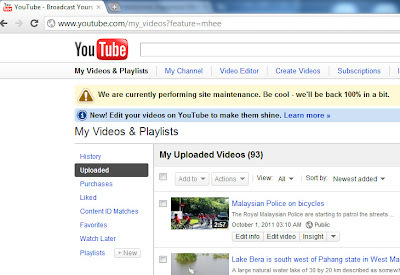 Your upload will continue but will not go live or be editable until read-only mode is over." I'm wondering in my mind, why didn't they just stop the uploading function for the time being and give out a warning notice that it is non-functional due to maintenance, upgrading, updating etc... instead of letting the patient user proceed to spend the many minutes trying to get a negative result at the end. Hahaha! I am glad that he has learnt to manage his EQ better growing up, to become a more rounded person as described in his personal family profile, though he is still a very unique person in his ways. A customer ran into some computer problems and called the help desk for assistance. Here was how the conversation went…. Ok YouTube is back and running normal about 6pm here so we did have to wait quite a bit since 8am in the morning to enjoy! Happy Birthday Su Min LIU from everyone at Familylane! This video clip has been added to the post containing all the photos and videos of the trip to your wedding in the US found here.